What? 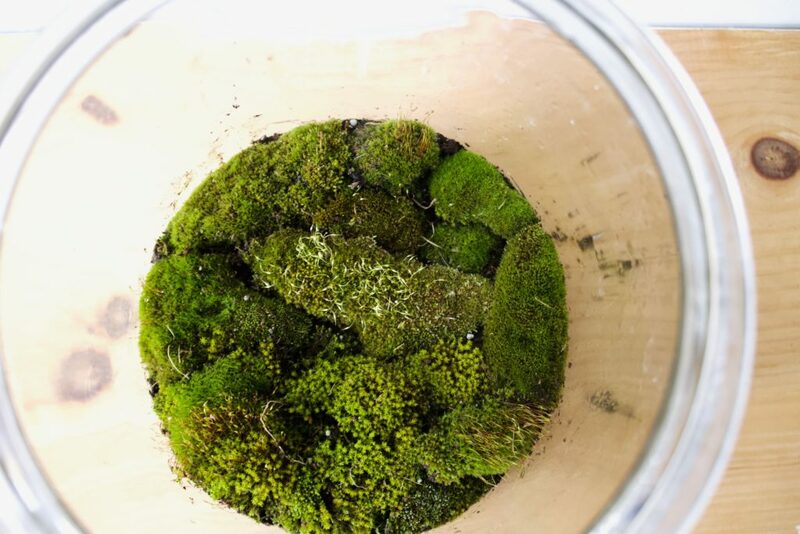 That gross outdoor moss can be made into a terrarium? No way. You be trippin’. 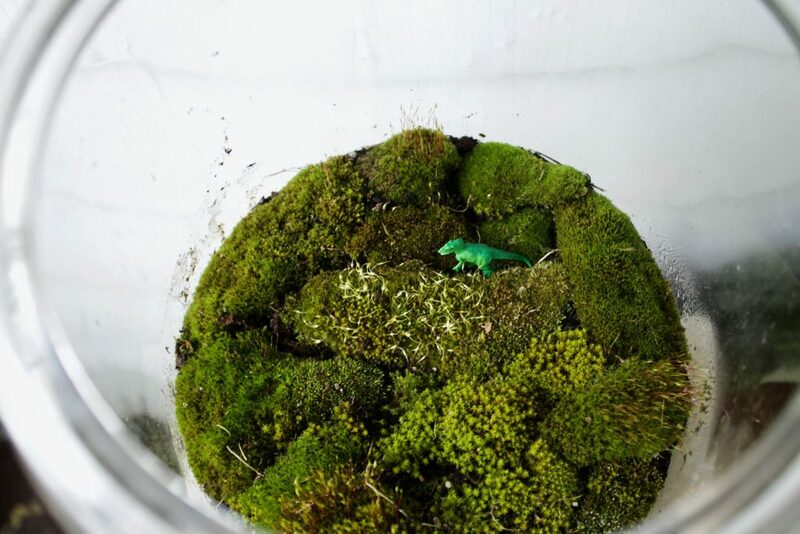 Completed, my moss terrarium looked like a tiny Ireland – full of lush and dewy green. But it needed something, so I added Ted (see above), this tiny T Rex. There, just like present-day Ireland. Lately, I’ve wanted some small houseplants for terrariums, and I think this just fit the bill. On that note, it was also free. Yup, moss is free everyone because it’s freaken everywhere. 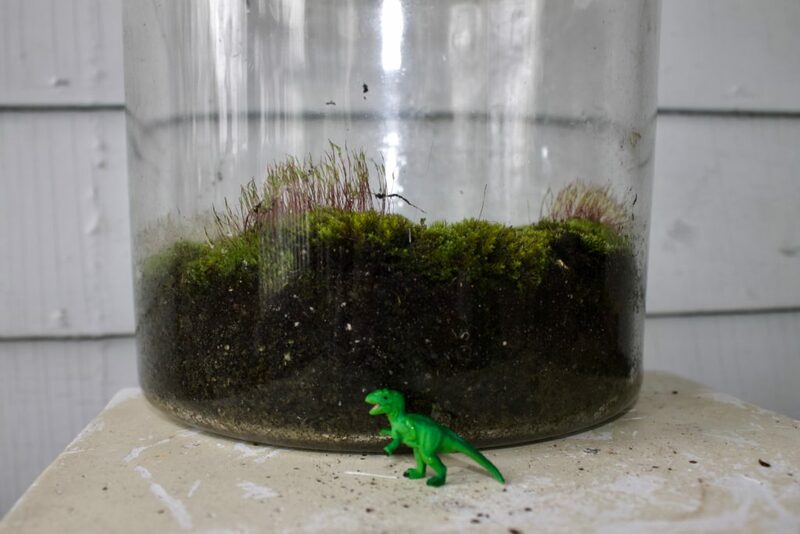 I did bit of reach about moss so you can make a (free) small jar of Ireland in your home (T-Rex optional but recommended). To say there are a few different kinds of moss is an understatement considering there are over 10K kinds all over the world. 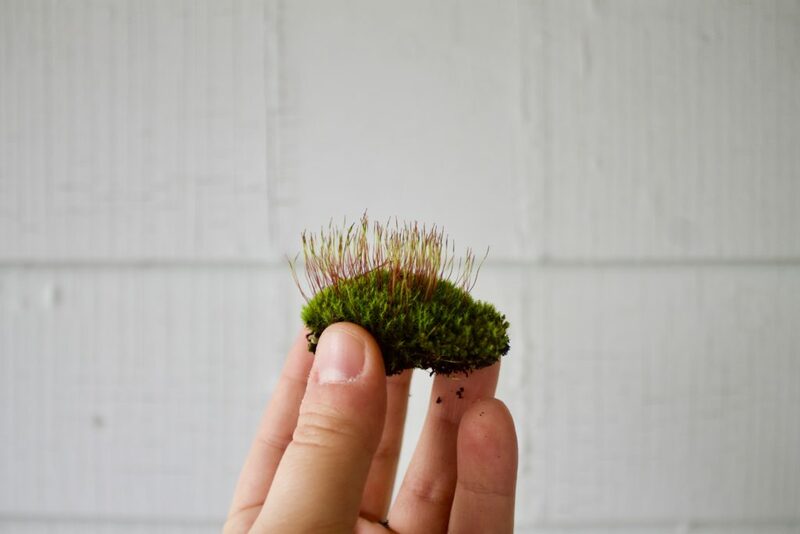 Certain types are more common depending on where you live, but generally, free range moss is known as Cushion Moss, Irish Moss, Krauss’ Spikemoss, Spreading Club Moss, or Trailing Irish Moss. Kate Moss is unrelated, I learned. Mosses are bryophytes and don’t operate the same way a typical plant does. Actually they are kind of an inverted plant. Those adorable fuzzy hairs you see on the surface are called rhizoids which act as the roots and drink water, and also anchor to your backyard firepit. Moss is a non-vascular plant which means they are missing the water-transporting vascular tissue. Their little rhizoids on top are actually their roots and do this for them. Your annoying patio moss is completely safe to bring indoors and can actually thrive indoors. I would recommended cleaning it a bit first and inspecting for bugs before placing in your terrarium. Lice and those small, creepy red bugs can be hiding in the crevices. Also keep in mind where it’s from. If you find moss from an area high in pesticides or chemicals, it may not be safe to handle or keep around pets. Note: cats really like moss. 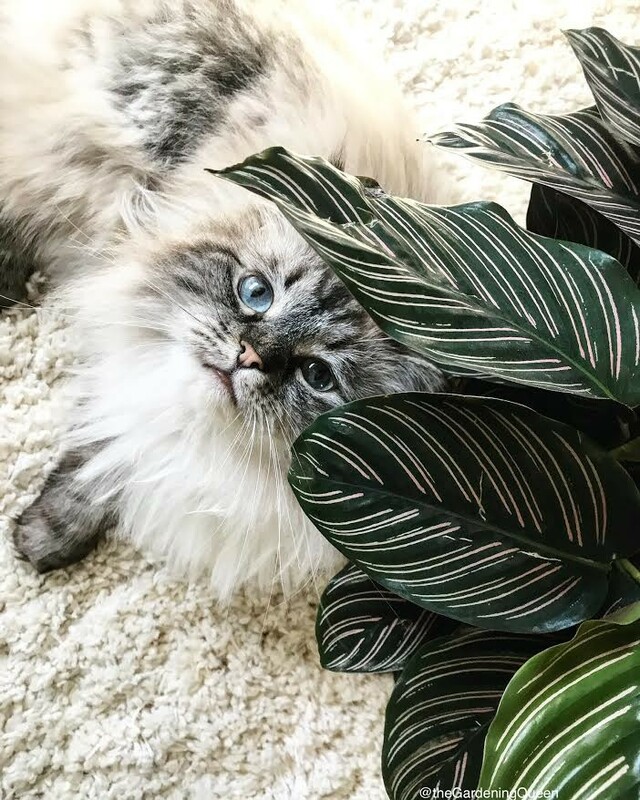 Is moss safe for cats and dogs? 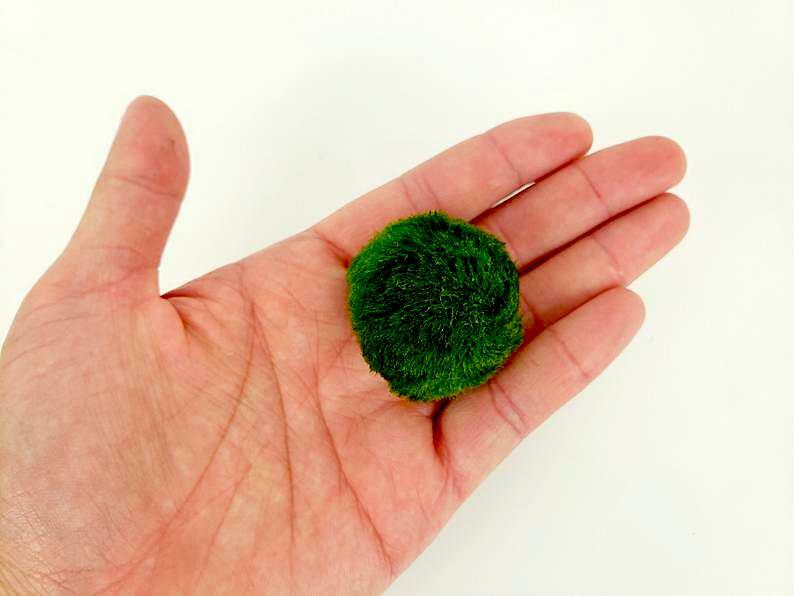 Yes, fluffy moss lumps are safe for your fluffy fur balls. Just another reminder that any outside moss with pesticides can be hazardous to people and pets, so clean, natural moss is the best way to go. 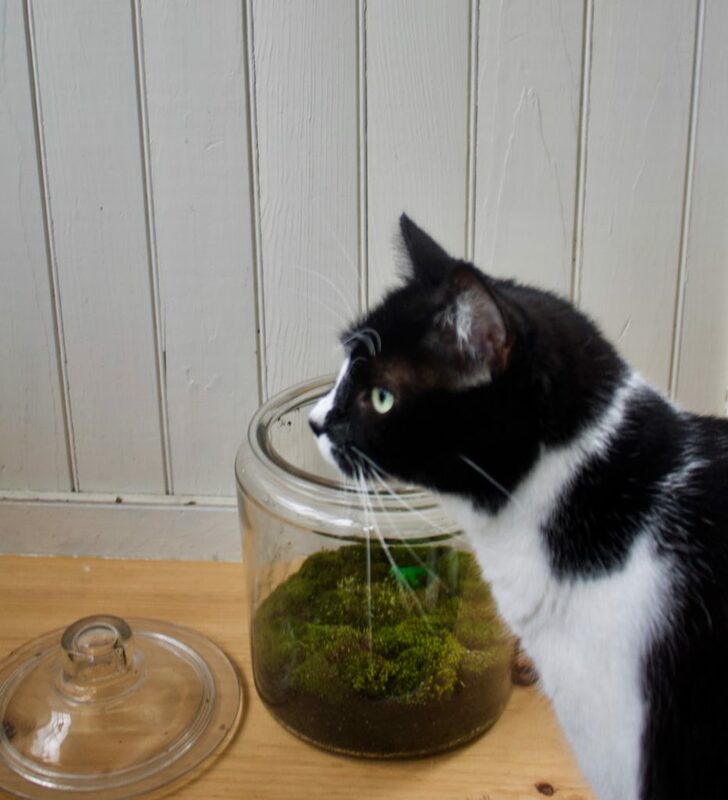 Moss and the aquatic moss balls Marimo, are non toxic to cats and dogs. As with any plant, I would still caution against consistent pet consumption with moss or any plant. The gathering process is not difficult at all. Put on your galoshes and find some good, puffy moss – green in color and moist. Gently pry it from the surface and bring to its destination immediately. Keeping it without moisture or in the sun for more than a few minutes can cause it to turn brown. Gather your materials and find a nice warm space. Make sure the jar is clean and put about three inches of potting mix in the bottom, leveling it out with your knuckles. Spray the soil with water to dampen it. 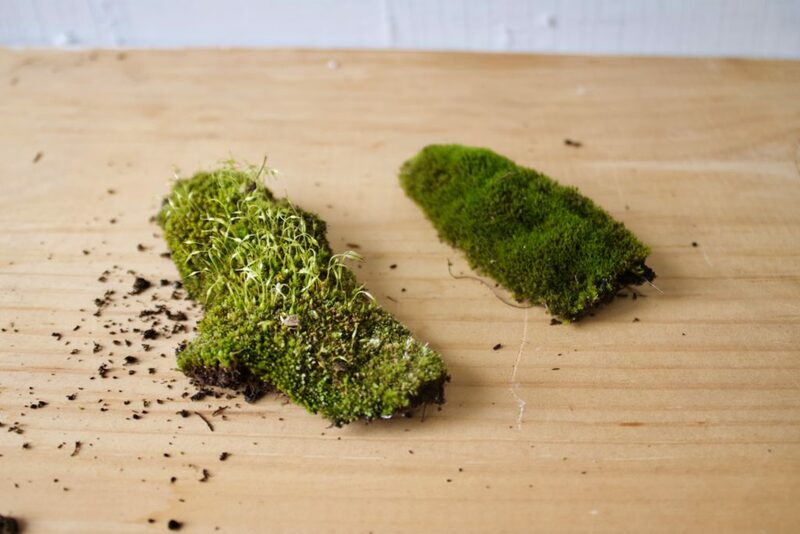 Gently press the moss chunks in piece by piece. Ty to line up straighter edge with the outside of the jar. Use the chopstick to further press pieces in. You can also tear away excess if a chunk is too large. 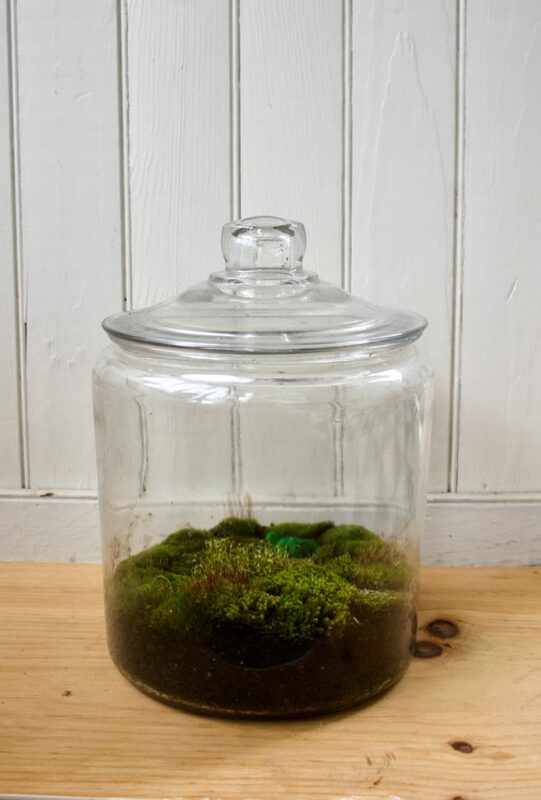 Once all of the moss is in and you’re happy with your world, give it a generous spray of water. Place in a bright room (but not in direct sunlight) and add the lid. Let it sit for about an hour. Once the moss dries out a bit, add in your favorite town-dwellers – animals, faeries, Batman – anything goes. This is your world. Light: Keep your jar in a bright to medium light location. More light will mean more water. Moisture: Moss = moist. The first two weeks check the moisture level, you’ll most likely need to give it a good spray 4-5 times a week. Feeding: No fertilizer is necessary IMO. Maintenance: If moss becomes brown or unsightly, just change it out and refresh. 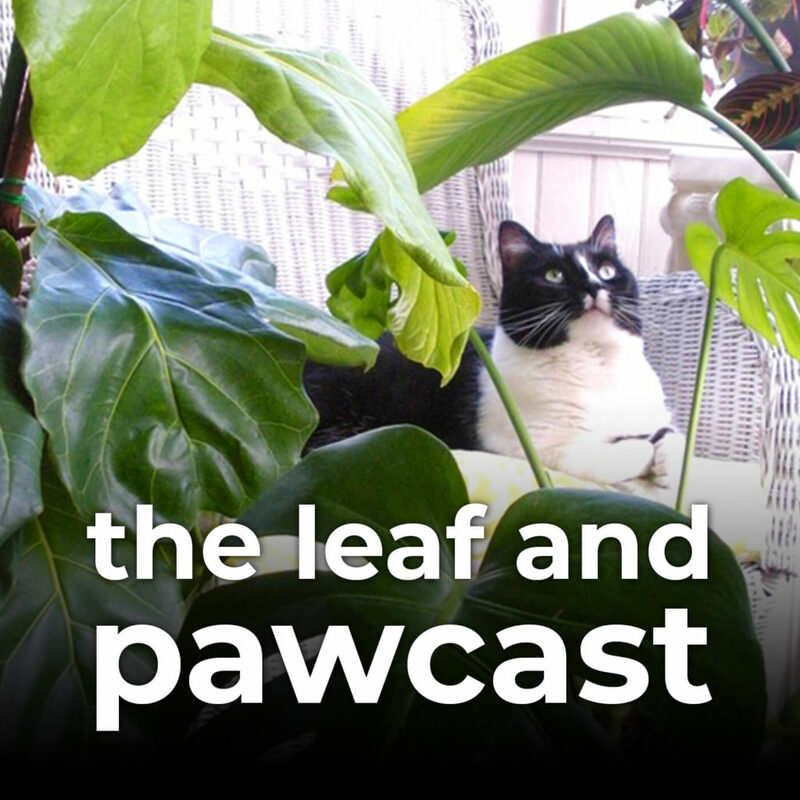 Marimo Balls are another mossy option, and are also completely safe for cats and dogs. They follow a more aquatic set of rules, so another blog post about them is in store. You can find Marimo from Amazon or Etsy. 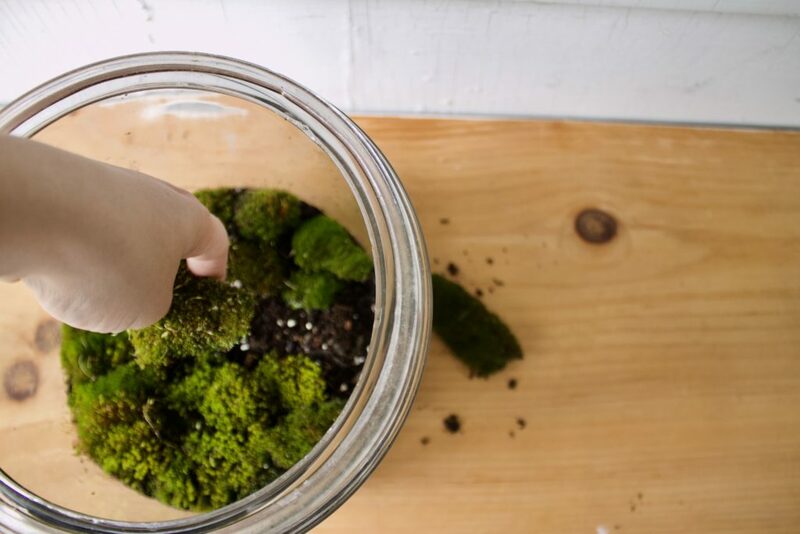 Want to join in the fun but have questions about making your own moss terrarium? Leave a comment!